Last week, Teza asked me and my fellow garden forumers (is that even a word? ), to write about our favourite nursery. At the time, I couldn’t think of any. Sure, I liked some of the big ones, Lost Horizons, Humber etc, but none of them was a place that I could see myself working. And to me, that is what makes a favourite, could I see myself visiting there on a regular(daily) basis, and could I even picture myself working there. 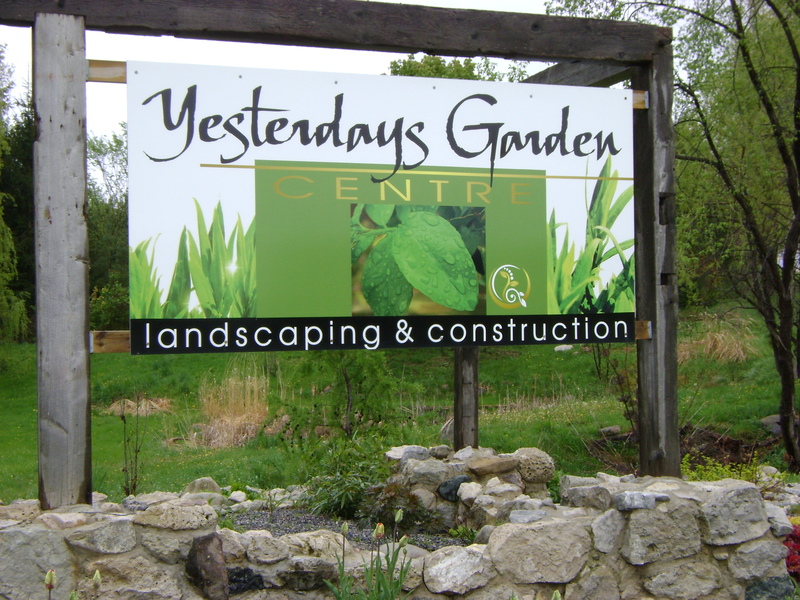 At the time, I had not come across a nursery that could make me feel that way, until this past weekend, when I went to pick up the Tilia trees I had ordered from Yesterdays Gardens. You know the feeling that you get when you are home, that warm fuzzy feel, I felt that right away. Turning up the gravel lane, your drive through a narrow tree lined tunnel, before the vista opens up. And you see them, gorgeous display gardens. Love that white metal arbour. Wait, I like this arbour too! Do they know I am looking for a statue? Arriving at the main sales area, we were greeted by two cats,and had a look around while the owner was serving another customer. look what was in it. 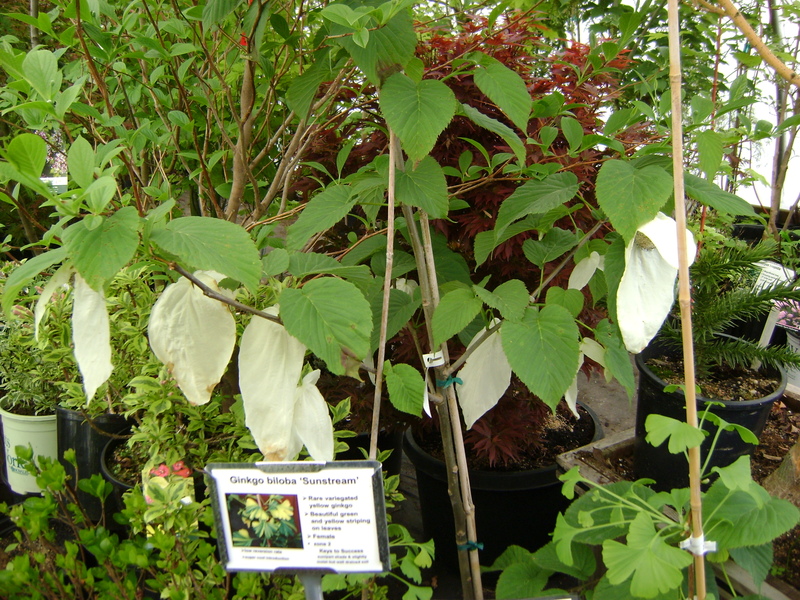 Davidia involucrata was a tree I had only seen in books and magazines, but here it was in the flesh. This variety ‘Sonoma’ , flowers in its second year, unlike the species, that can take up to 20 years to flower. 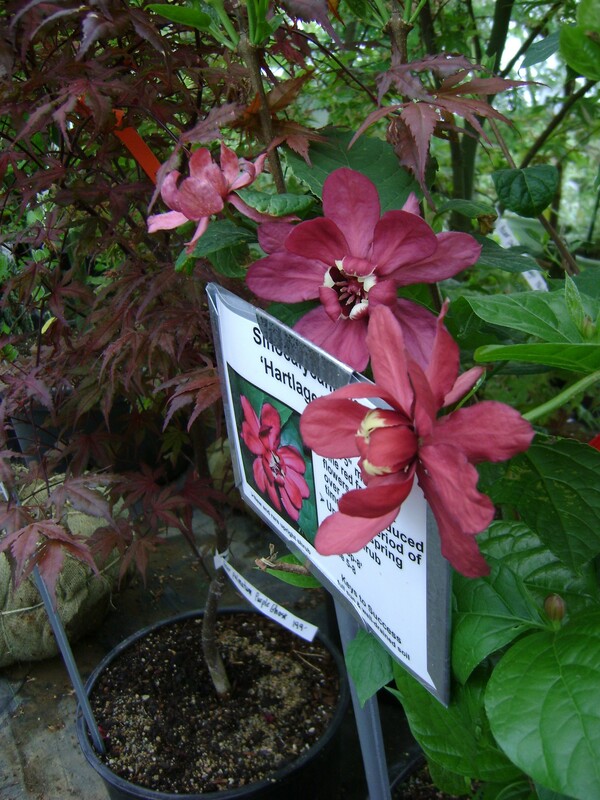 Sinocalycanthus ‘Hartlage Wine’, isn’t she a gorgeous colour. 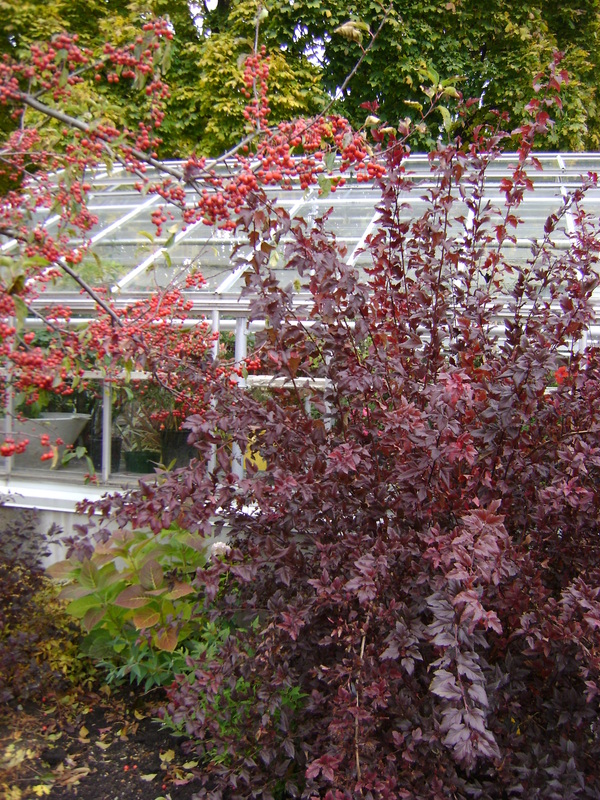 These were just two of the fabulous shrubs and trees in this hoop house, I want them all! Wandering back out to the main sales area, I was greeted by Karen Charron, who owns the place along with her husband Ron. And I mean warmly greeted. When I told her who I was, (and bear in mind, we had only talked on the phone when I was ordering the trees), Karen leapt out from behind the counter to hug me. Leading the way to the hoop house where my Tilias were stored, she kept us entertained all the way with stories about different plants and suppliers she knows. 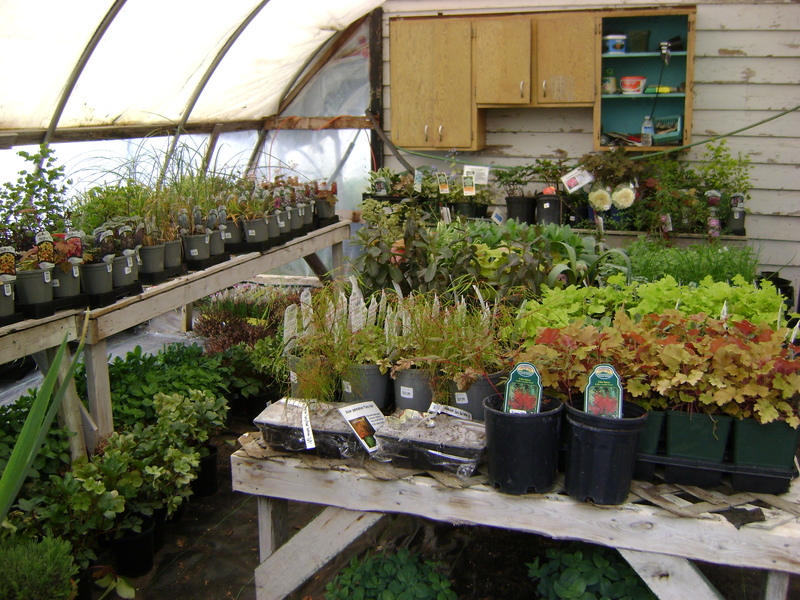 Yesterdays Garden was picked as ‘One of Canada’s Top 40 Speciality Country Nurseries’ by Gardening Life magazine and it is well deserved. Believe me, if Ian hadn’t been waiting impatiently, I would have lingered for hours, and dropped a pile of money as well. 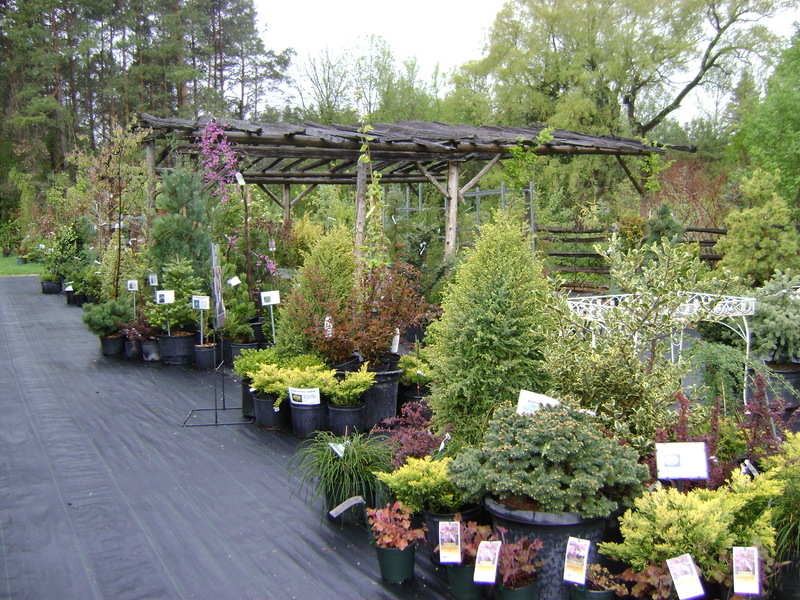 Luckily for me, (and unluckily for Ian) this amazing nursery is a 10 minute drive from my fathers house. I suddenly feel the urge to visit him ……….. I took another course on the 24th of October at the TBG. It was supposed to be on speciality pruning, they already had a basic course. It was made up of two types of gardeners, Home gardeners (all women, for some reason), and “professional” landscape gardeners (who were all men). These men all worked for the same company, and they were there to learn “how” to prune. Their company wanted to learn how to do it the “right” way, not shearing shrubs into little round balls (I think that we have all seen that). While I commend them for this, I was also annoyed. The course became basic pruning, at least 99% of it was. The last 5% was devoted to speciality pruning, ie: pollarding, espalier, etc. I took it hoping to get some help with my pleached Lime Walk, something that is very “uncommon” in Canada. But, alas, there was no help to be found. But, while I was there, I took some pictures. The difference in the last three weeks is huge. I would love to look out my window and see this. What amazing colour, almost orange! 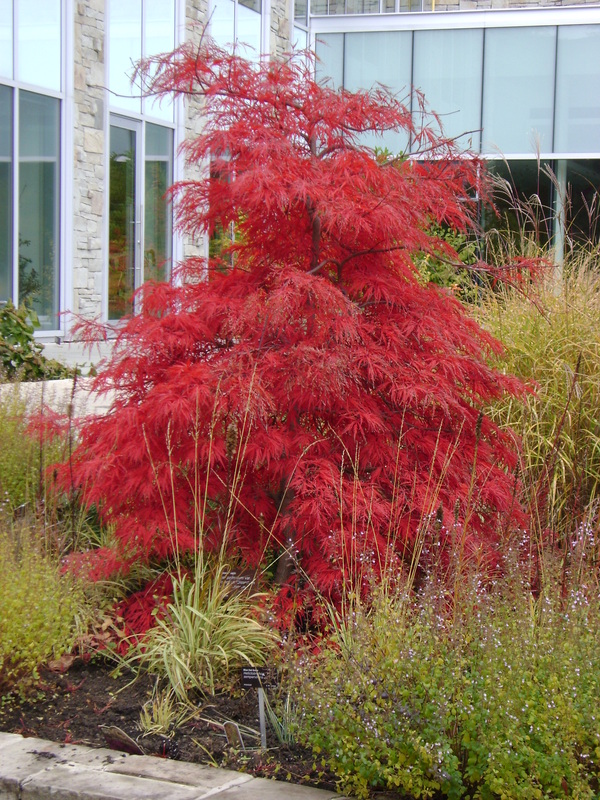 Why are my Japanese maples not this colour? A fabulous contrast in colours. 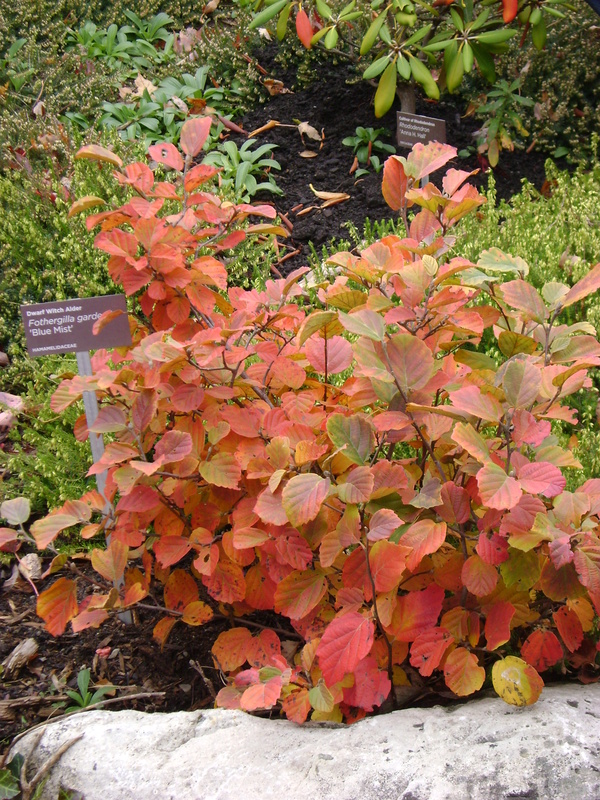 This is fothergilla “Blue Mist”, what a lovely colour. 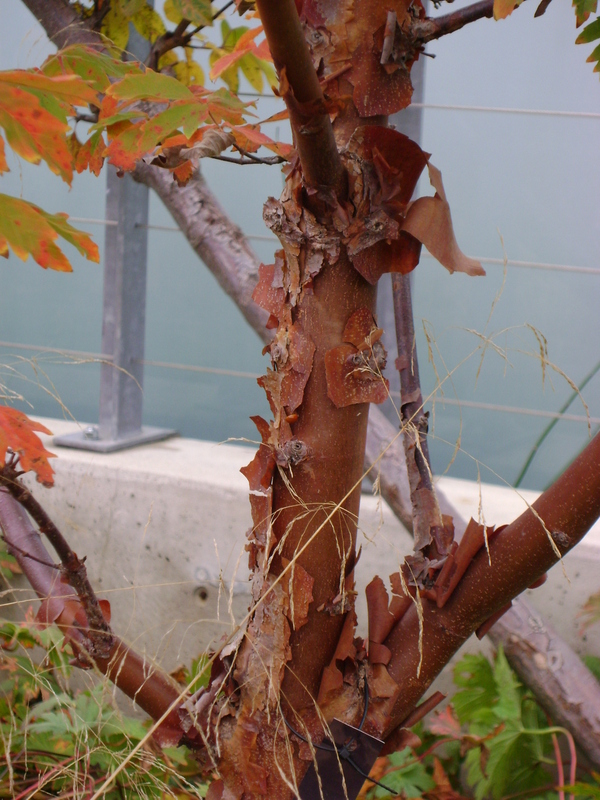 The paperbark maple, or acer griseum. Look at the bark, it really stands out against this blue glass background. This crabapple is just loaded with fruit. Love the way it hangs over the berberis. Again, great colour. Perhaps some planning for next year now, will give me better colour next year. P.S. Sorry, I got the order of the posts mixed up. After I said in the last post, “it is the last one on the TBG”, I publish this one. This is the last, I swear! It won’t be long till I have a lot of nakedness at my house. Trees, people, get your minds out of the gutter! Leaves are coming down rapidly now, soon a big wind will come along and that will be it for another year. I found the leaves were not as nice a colour this autumn, at least not in Owen Sound. 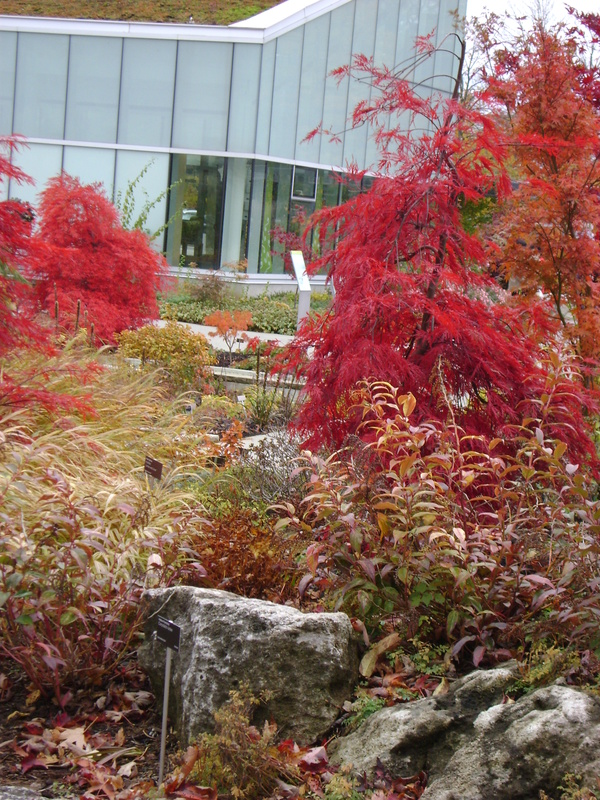 I was at the Toronto Botanical Gardens for a course on the weekend and the colours there were fabulous. I am working on a post with pictures from there. 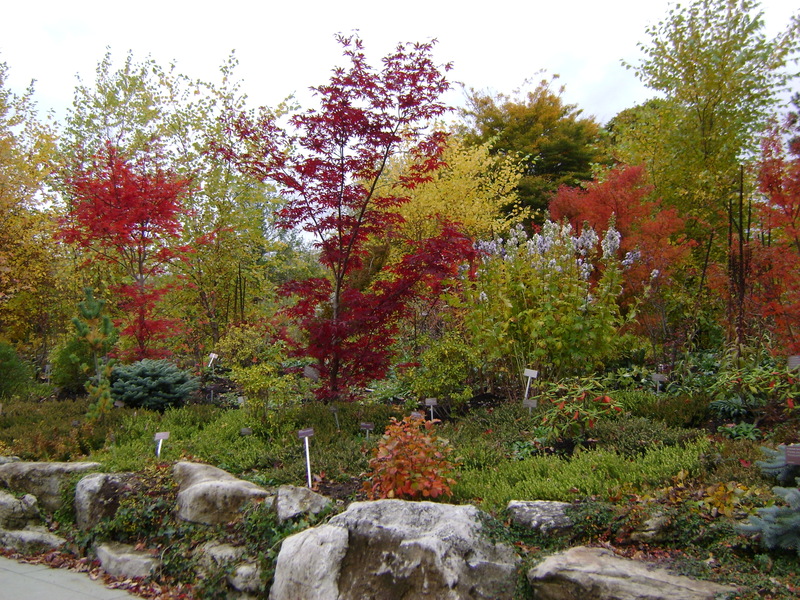 Everyone seems to have amazing photographs of autumn colour, but at Kilbourne Grove it was pretty quiet. 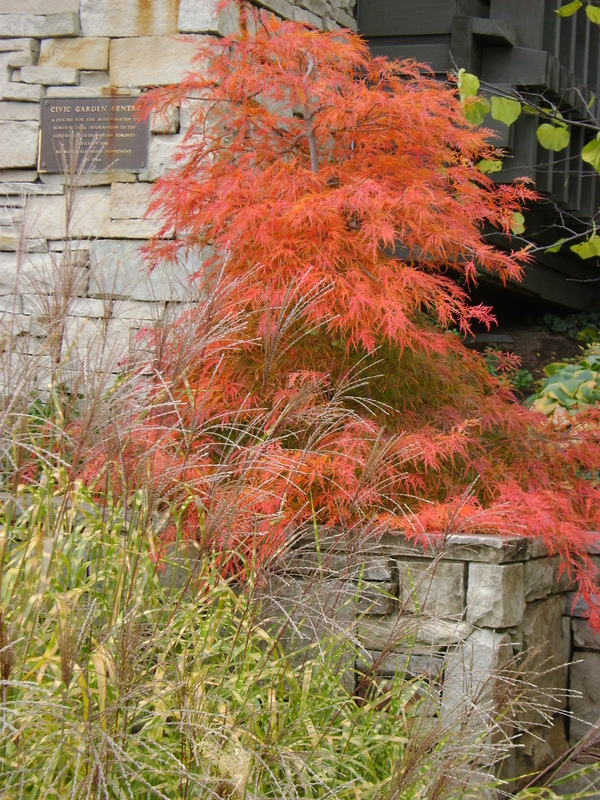 I don’t know why, I have a sugar maple, silver maples, Japanese maples. 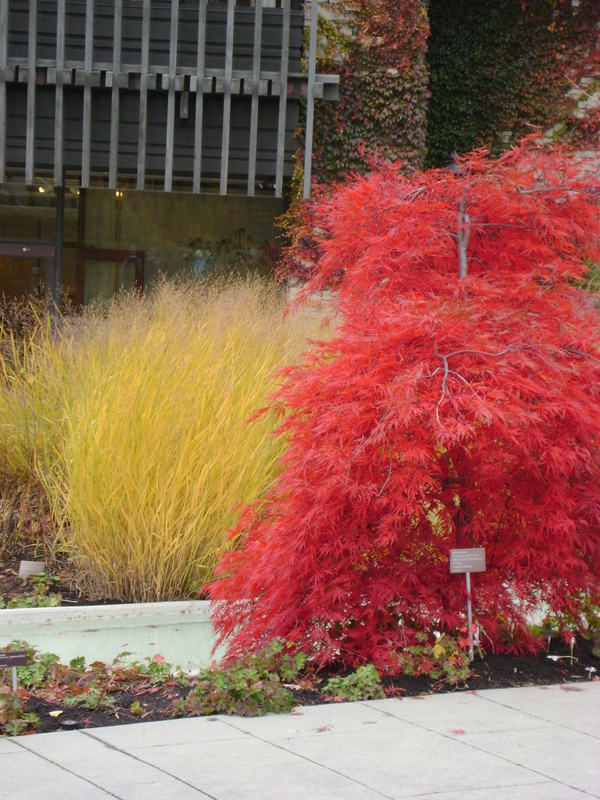 Why don’t I have that famous eastern North America colour in my garden? 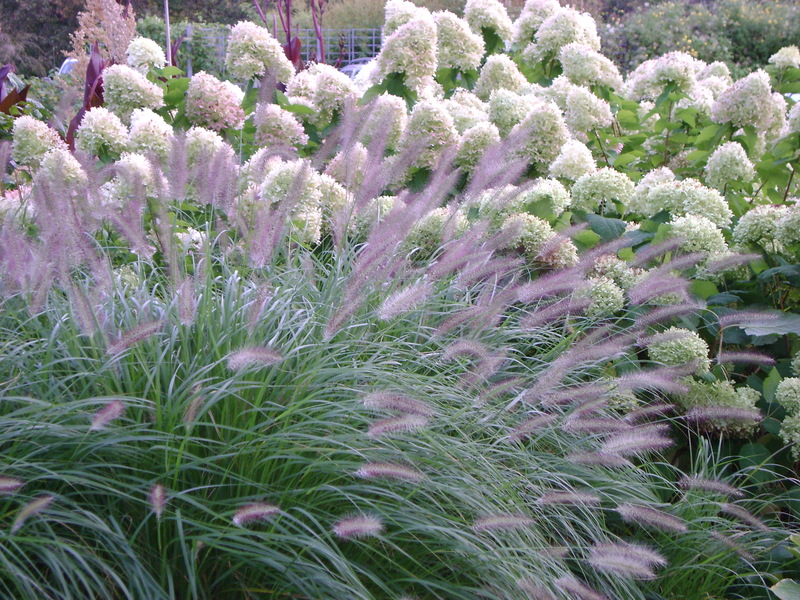 The japanese blood grass, is well, gorgeous. Give it a few years, the clumps merge together, and it will be a sight! 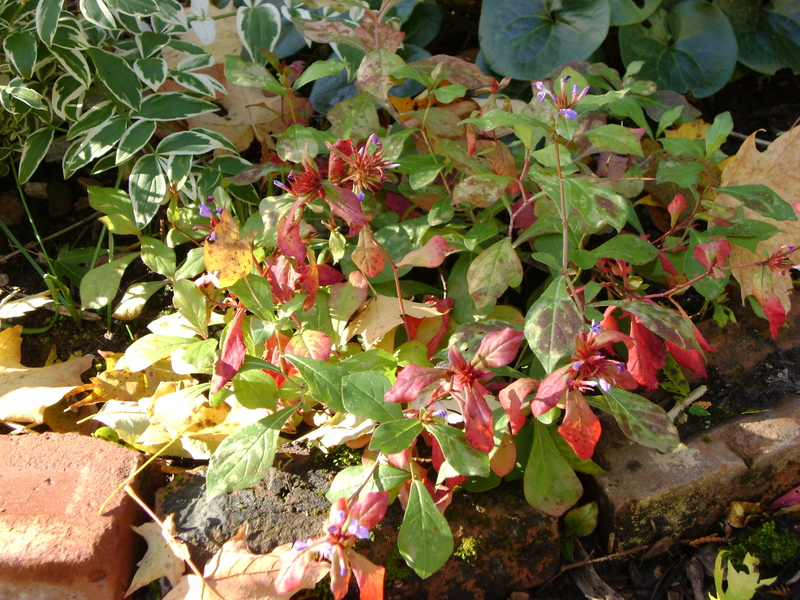 The cerostigma plumbaginoides is turning red. A great contrast to the blue flowers (which are almost finished). 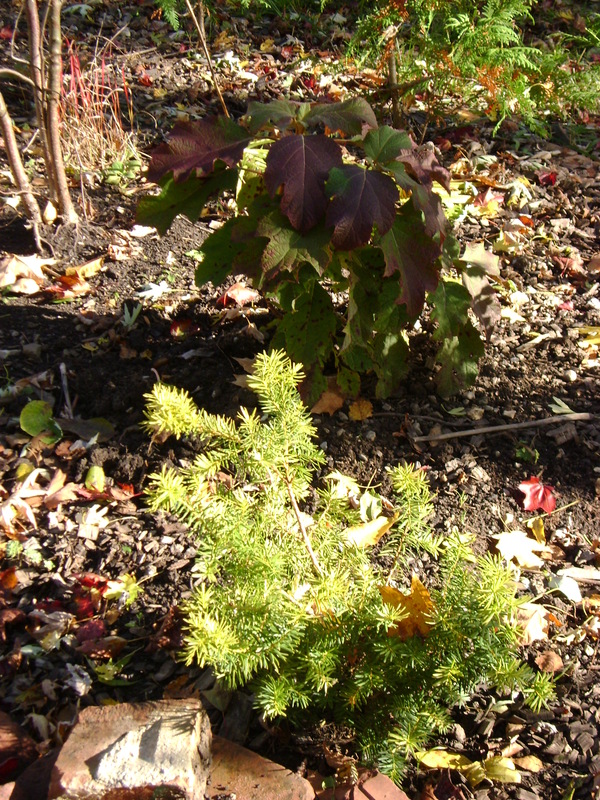 Here it is planted under the cornus kousa I planted as a memorial tree for my mum. Look at the amazing purplely colour of the leaves! Look at the oak leaf hydrangea. I love the contrast of that dark purple against the golden yew. 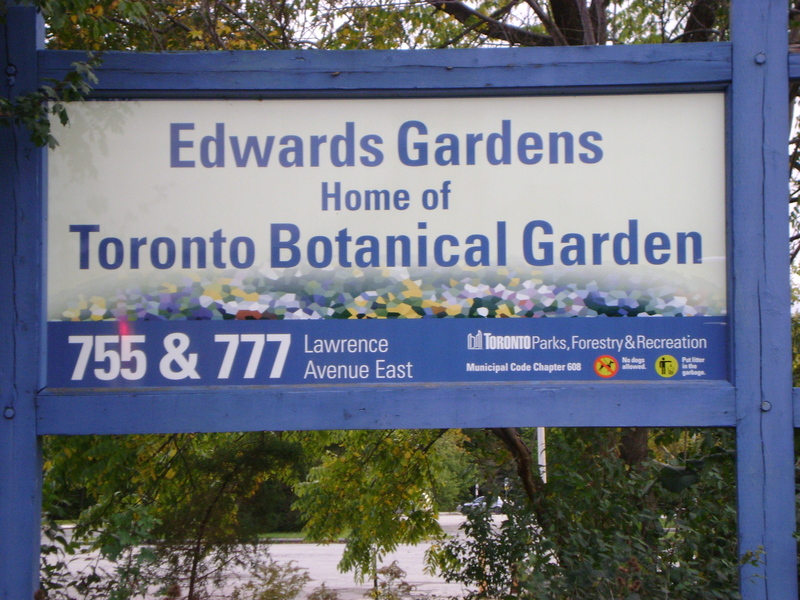 Three weeks ago, , I took a garden course at the Toronto Botanical Gardens or TBG. I had to take a bus as I do not have a car, and I wasn’t sure how long it would take. I got there a few minutes early and I walked around and took a few pictures before my course started. The sun was just starting to set, so some of the pictures may be a bit dark. The plants were all marked with their name, but I didn’t have time to stop and write them down, if there is something you really want to know the name of, I might be able to get back. The TBG was redesigned a few years ago. It is now 12 award-winning, themed gardens, encompassing almost 4 acres. The main building is a glass pavilion and features a “green” roof. Walking from the bus stop, you walk through the Entry Garden Walk, which is a “sophisticated Meadow” and inspired by Piet Oudolf. 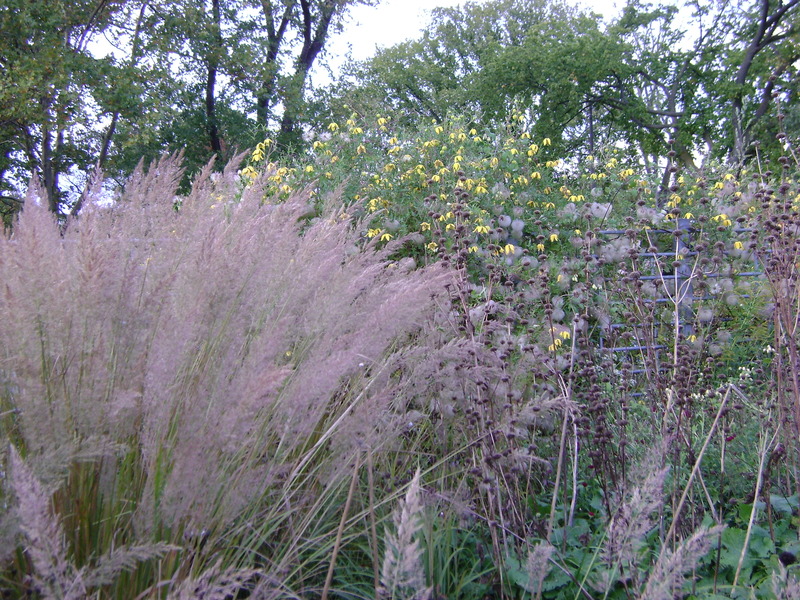 A mix of perennials and grasses, I think that it is at its best this time of year. See if you agree. I wish I knew what the name of everything was. Not that I have the space for it in my own garden. But they are very beautiful. 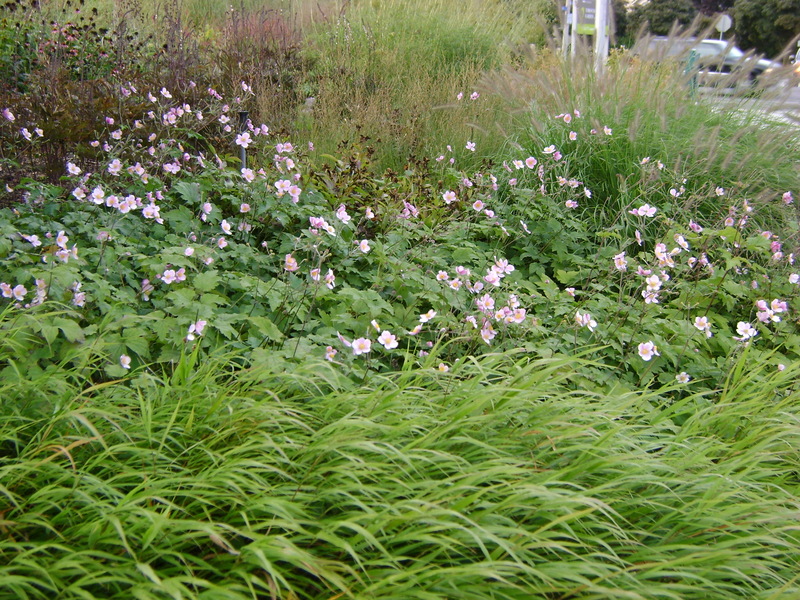 At keast, I know these, hakonechloa (my fav) grass and japanese anemones. You then arrive in the Arrival Courtyard, (if you drive, you arrive directly here). 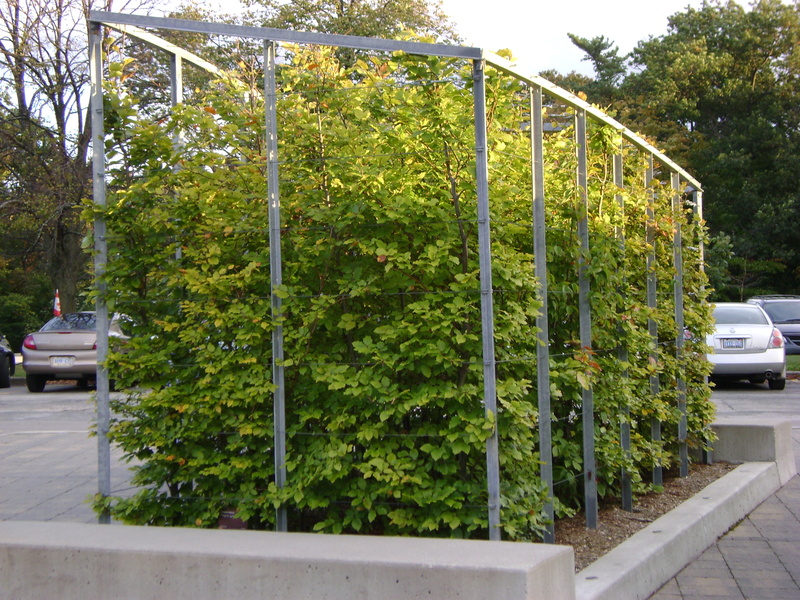 Sculptural hedges made up of cornus mas and beech are being trained inside of a metal cage. 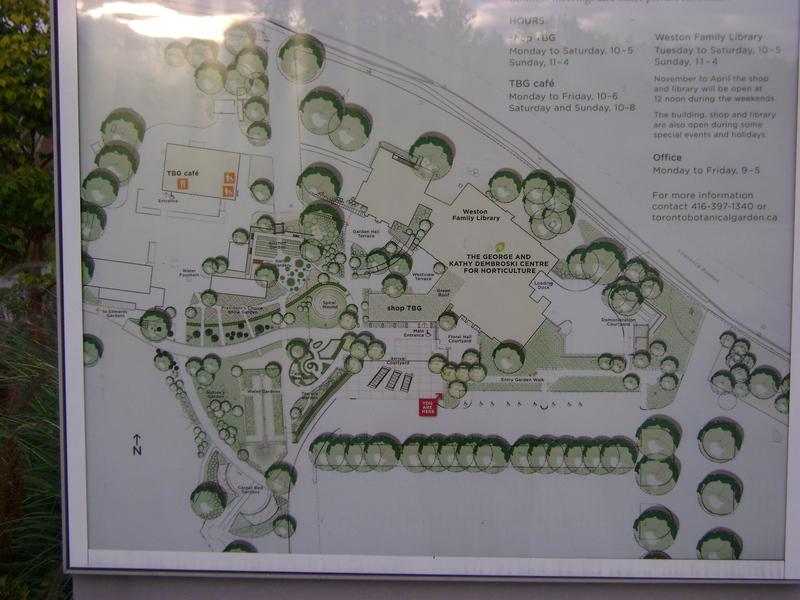 There you can find a map of the garden. From here you can go into the different gardens a number of ways. Lets go into the Garden Hall Courtyard. 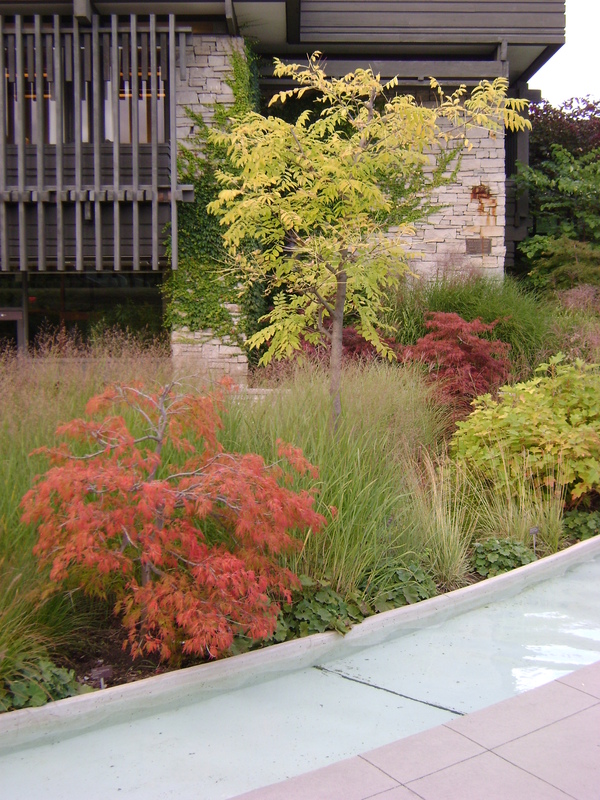 This area features a sunken courtyard with a diverse mix of trees, shrubs and perennials, and features a large selection of Japanese Maples. I believe these were the full moon japanese maple. 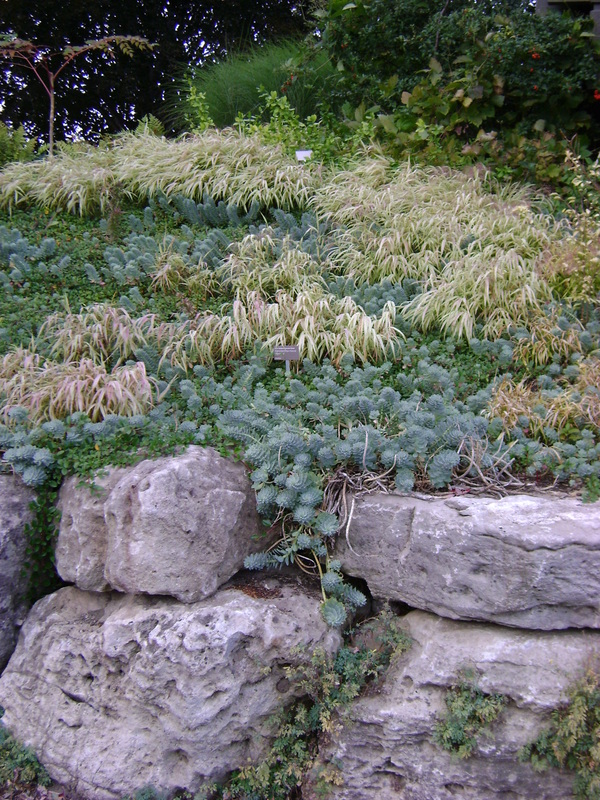 They are underplanted with hakonechloa grass again and with euphorbia myrsinites. Love that chartreuse and blue together. From here I went into the President’s Choice show garden. 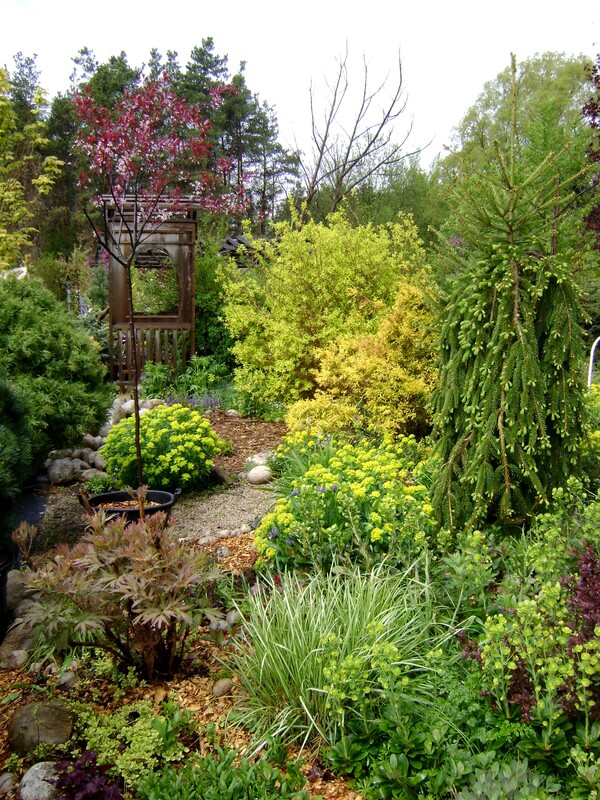 This is made up of two sections, one featuring evergreens and small trees and shrubs suitable for a small urban garden and a trial garden area. Tigers Eye sumac is a great contrast against the blue. Echinacea with a paniculata hydrangea, heuchera, grass and a dwarf cleome. From the other end, this was a great combination, all that pink reminds me of Grace. Here at the end is a petunia and variegated pokeweed. A closer look, not sure what the pale butter, yellow flower is, but I like the contrast to the pink. 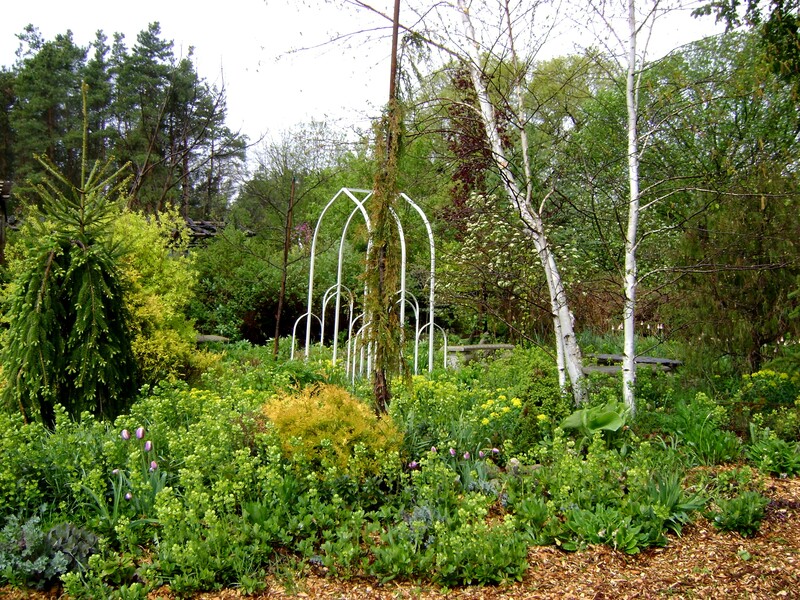 There are many more garden areas at the TBG, including the Herb garden, Kitchen garden, Knot garden, Teaching garden, Spiral Mound, the Terrace garden and the Woodland walk. 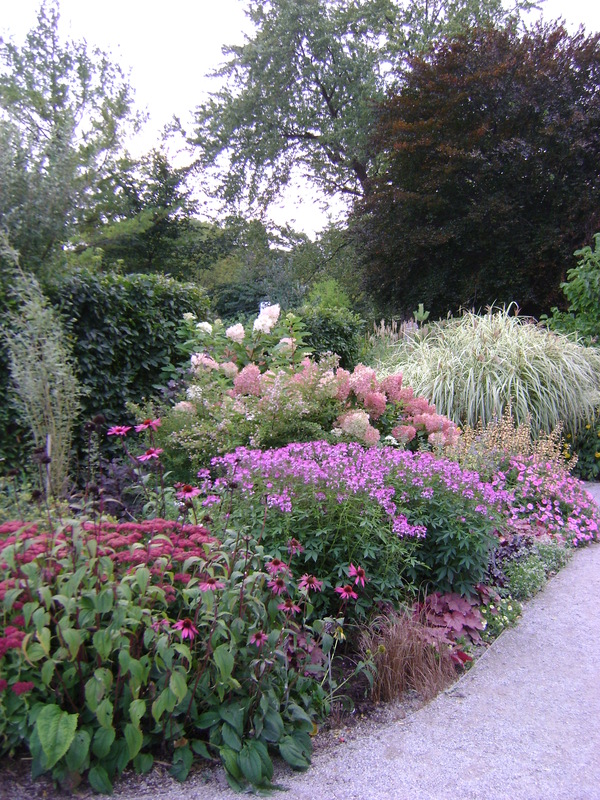 I visited another very lovely garden when I was in Kingston, the middle of August. 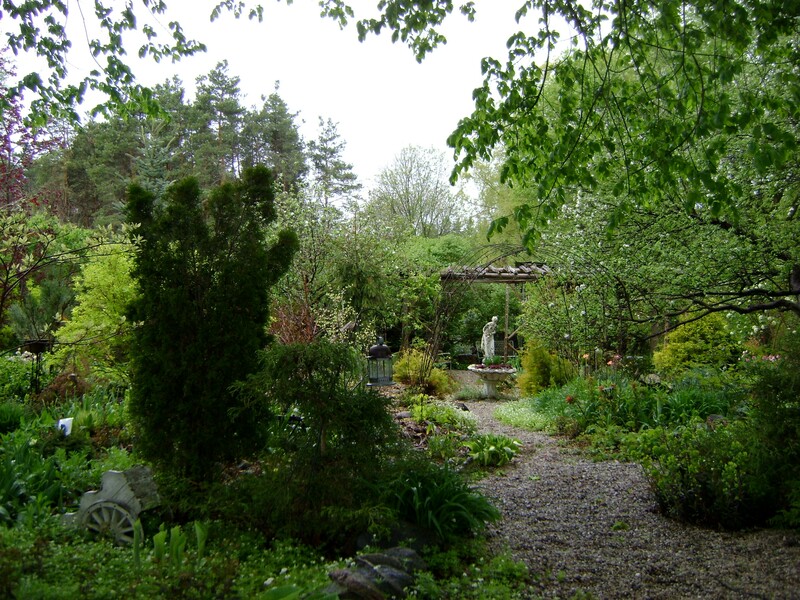 Lois Smith has a major garden on the family farm near Moscow, Ontario. What started with a horse paddock in the front of the house, has become an obsession for the gardener. When her children’s attention turned from horses, Lois decided that the paddock would be a good place for a garden. 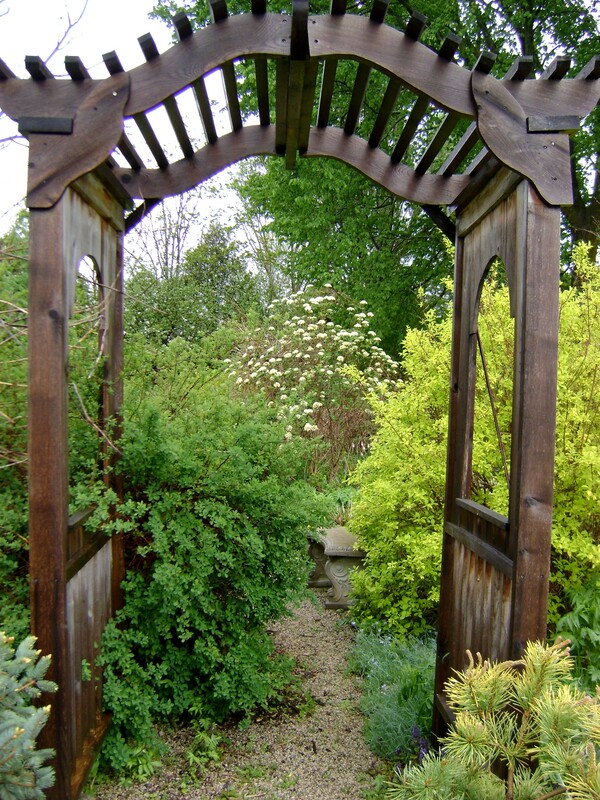 Starting over twenty years ago, she has carved out a huge garden, with many meandering paths through it. Her secret to having such a large garden and not have it become a weeding nightmare is “hay”. Yes, that is right! She does let it age a year before she uses it to mulch the flower beds, this way the “weed seeds” in it are not as viable. When this garden became “filled”, Lois turned her attention elsewhere. 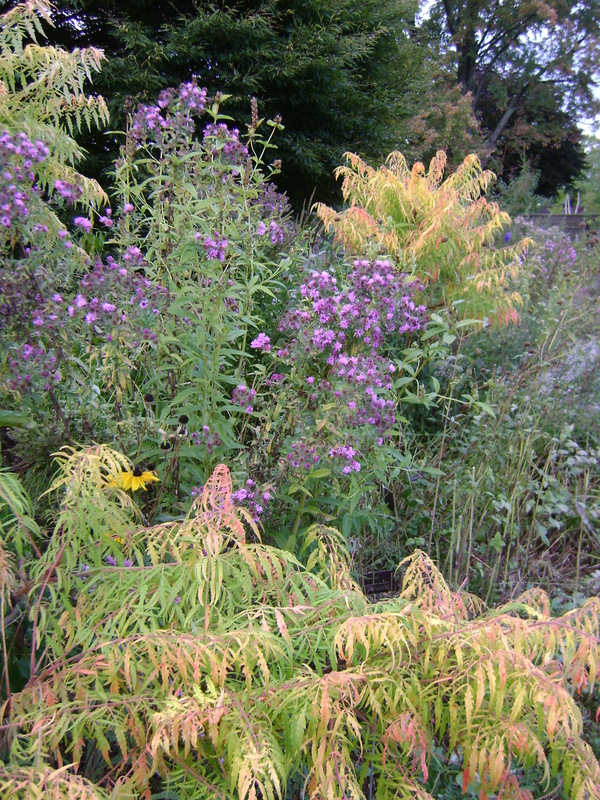 A large field on the north side of her house is slowly being turned into an arboretum. She has made it her mission in life to plant specimen trees here. A truly noble cause, as she will never see most of them come to maturity. Most people would say “Why do it?”, Lois says “Why not?”. Mowed paths through the field, take you from one interesting tree to another. The best feature is the allee that has a neighbouring church as a focal point. How many of us can say that! She has plant sales at her farm in May, where she sells plants that she has grown from seed, or divisions from her garden. She even grows trees from seed, and if you are lucky, she may even have one or two for sale. Come see what one woman can do with many wheelbarrows, a load of hay and a handful of seeds! The area directly behind the garage I have dubbed the “Flora Glade”. The name was stolen from Roy Strongs garden “The Lasket”. I felt as it was going to be a mix of flowers and trees the name was appropriate. 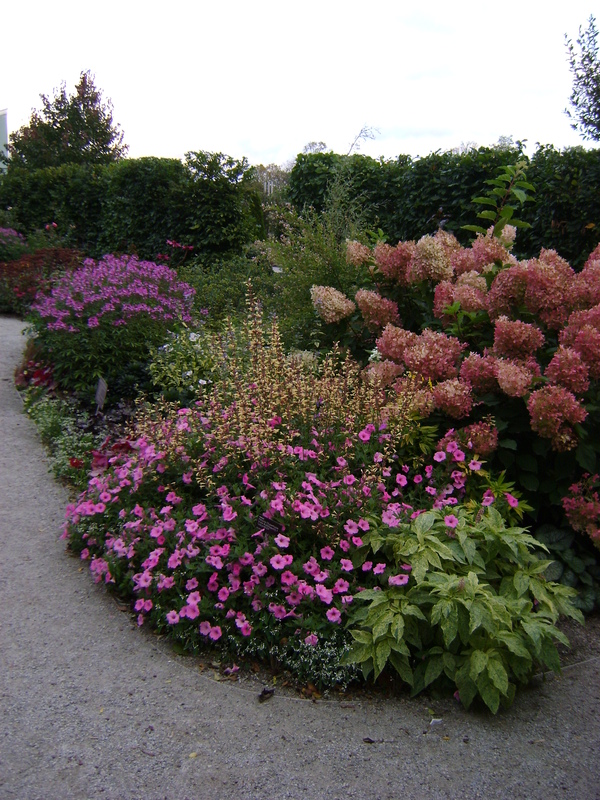 This is where almost all of the perennials are, as well as some shrubs. 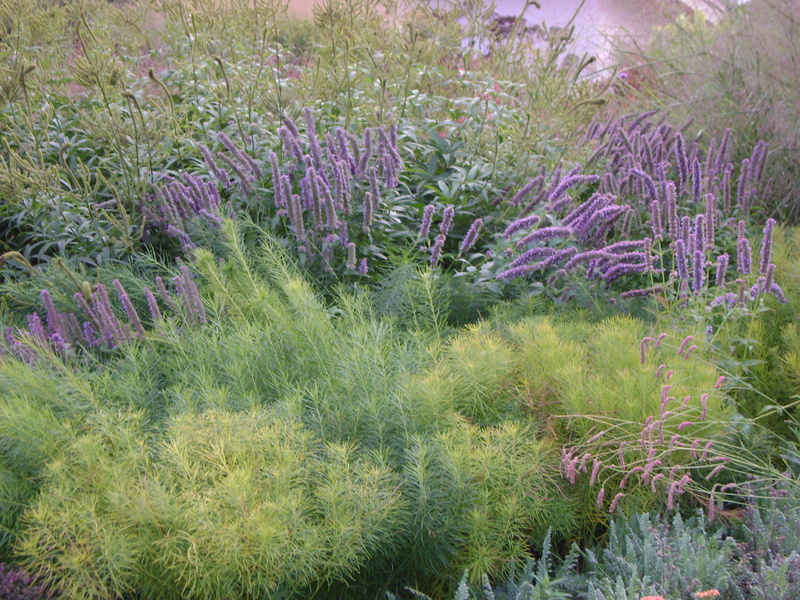 It is the one area that is a more ‘natural’ planting, instead of the straight formal lines that I so love. 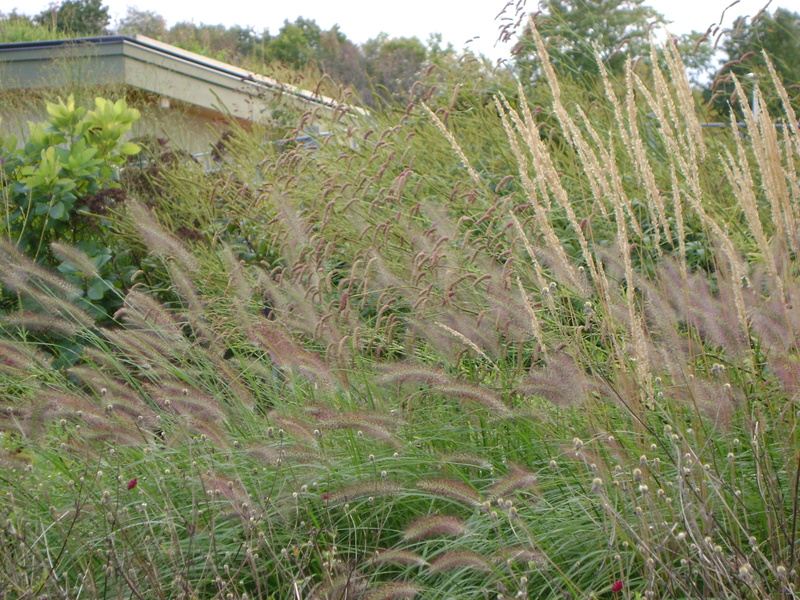 When we moved in, the only thing behind the garage was a large number of weeds. There was a huge pile of bark chips from some trees that had been cut down after being damaged during a storm the previous winter. Bricks were piled against the garage and there was 5 maples in roughly a straight line. So it was quite shady. I started by planting a cedar hedge in a straight line just east of the trees and then running (again in a straight line) between the trees and the “Kitchen Garden”. From the rest of the garden, this area will look geometric, not to be revealed as more “cottagey” until you are inside (at least, that is the plan). Then I made a bed under the trees,by laying bricks directly on the soil, then a layer of newspapers and then filling with topsoil. 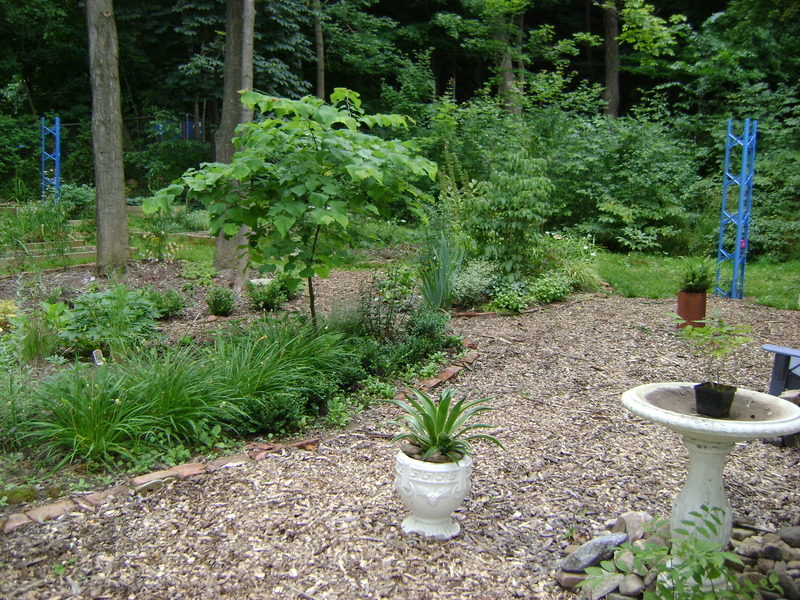 I divided them with paths (and used up the bark mulch) to the “Kitchen Garden”, and paths to the west, east and another to the south. 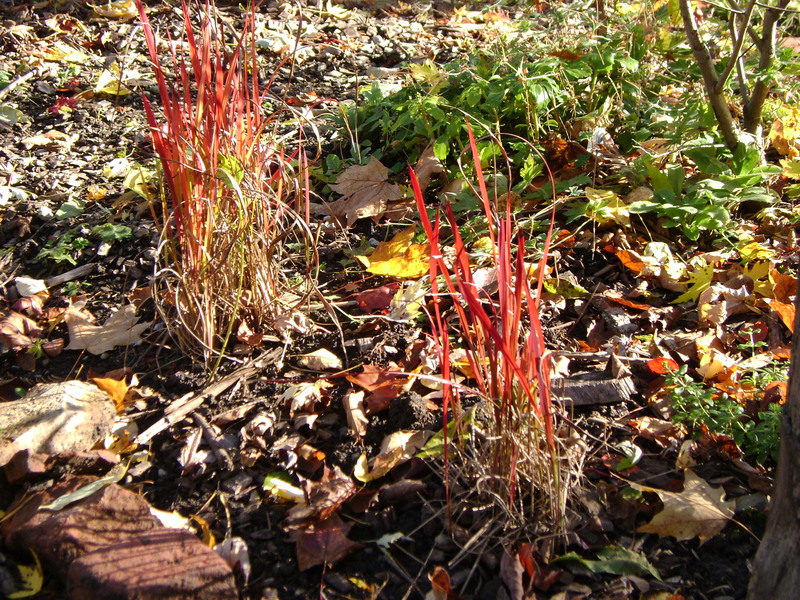 In this bed you can see 5 variegated willows that were left over from a planting at work. These I cut back to the ground in the spring and they are a lovely pink, white and green. Behind them is a birch clump. 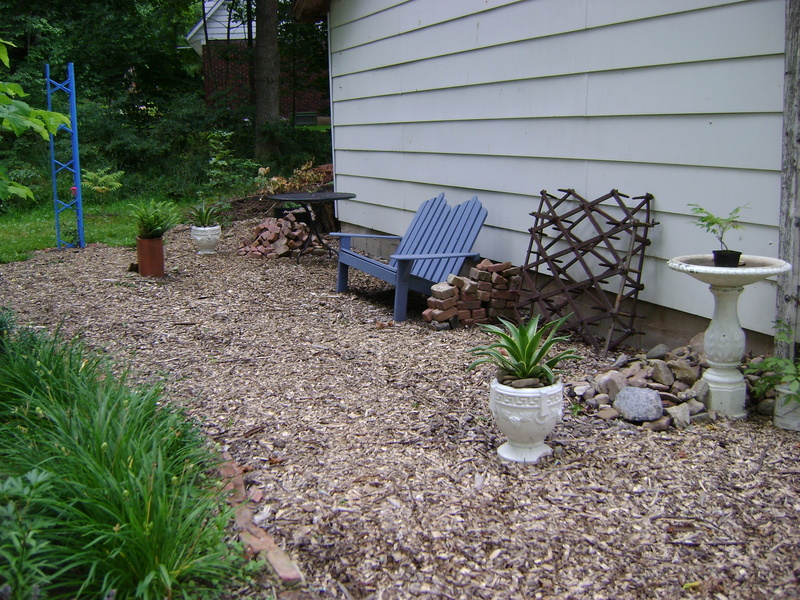 One problem with mulching the paths with the bark chips and the bed as well, no definition shows between the beds and the paths. There are bricks there, but they are slowly sinking down to ground level (another job to do, pull up my bricks). 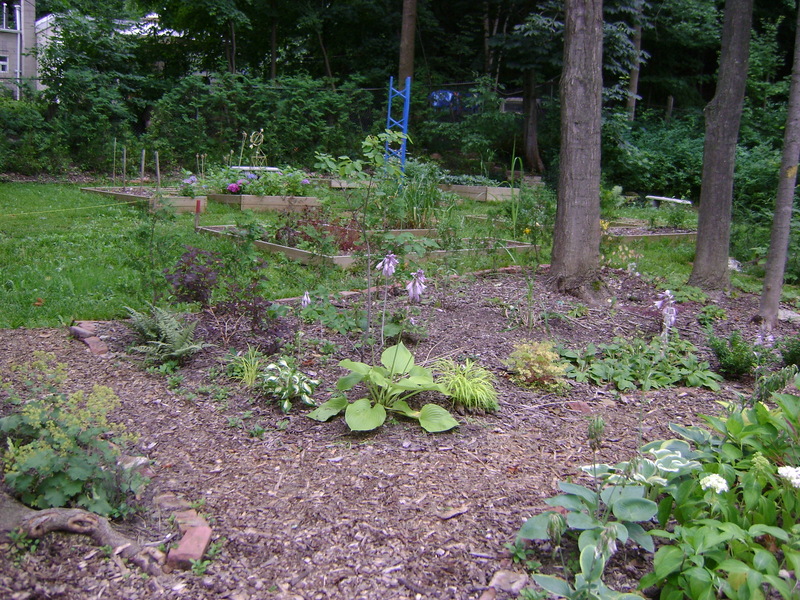 One I have more plants and the beds are filled in more, It should be more obvious, what is bed and what is path. I also put a large island bed in the middle. This I started in the summer of 2007. In the large island bed I planted a small redbud tree. I was worried that it wouldn’t be hardy in Owen Sound, but it has flowered and grown alot ever since. To balance it at the other end is a sambucus “Black Lace”. Sorry, for the poor quality of these photos, they were the very first shots that I took with my new digital camera, and I didn’t know what I was doing (I still don’t). The tree on the left has now been lost in a storm. I also built a smaller island bed west of the large island bed. In this I have planted a cornus kousa. This is my memorial garden to my mum. 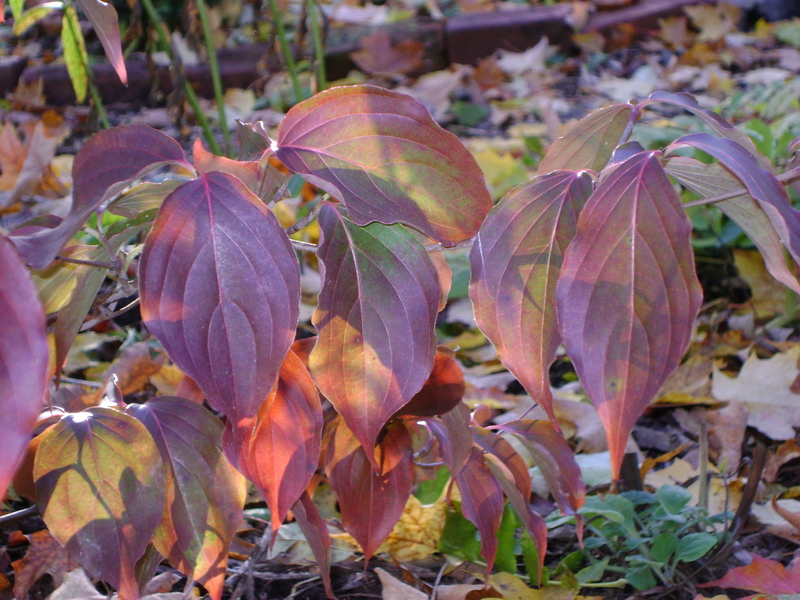 The cornus was her favourite tree, and she tried in vain to get one to grow for her in Niagara. It was replaced three times, before she gave up. This one has lived through two Owen Sound winters since she died, I think that she is looking after it for me. 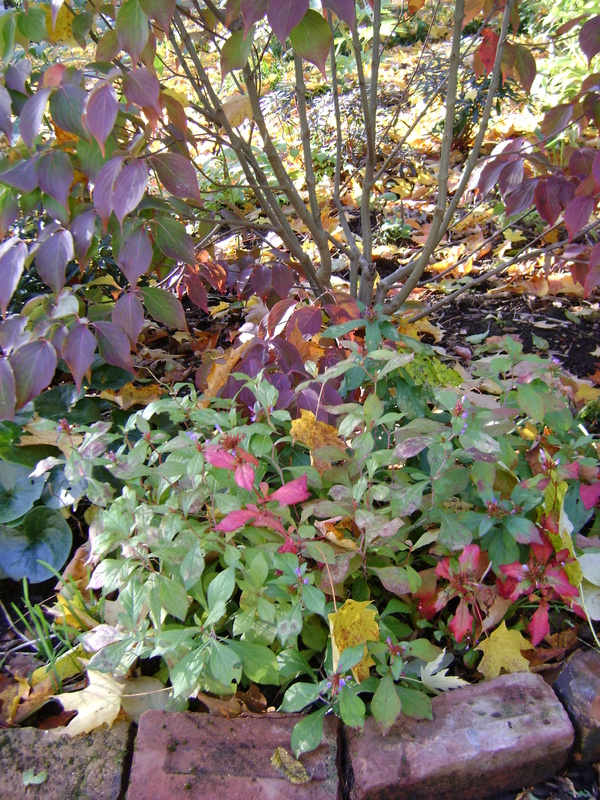 Here you can see the redbud and the cornus in the next bed. Can you see the cedar hedge, I don’t think so. It really needs that definition of edge. Behind the garage we are thinking of building a pergola , with a vine trained over the top. That is a set of harrows that my dad gave me. I saw a set turned into a gate at Stonyground, that great Canadian garden. There is still more bricks to be put to use somewhere. Everytime we dig in the garden, it seems that we find more bricks, I don’t know why they are buried. I have planted a lot of shrubs at the edge of the bed. I hope that as they grow, the paths will become hidden and more mysterious. You will not know what is around the corner. 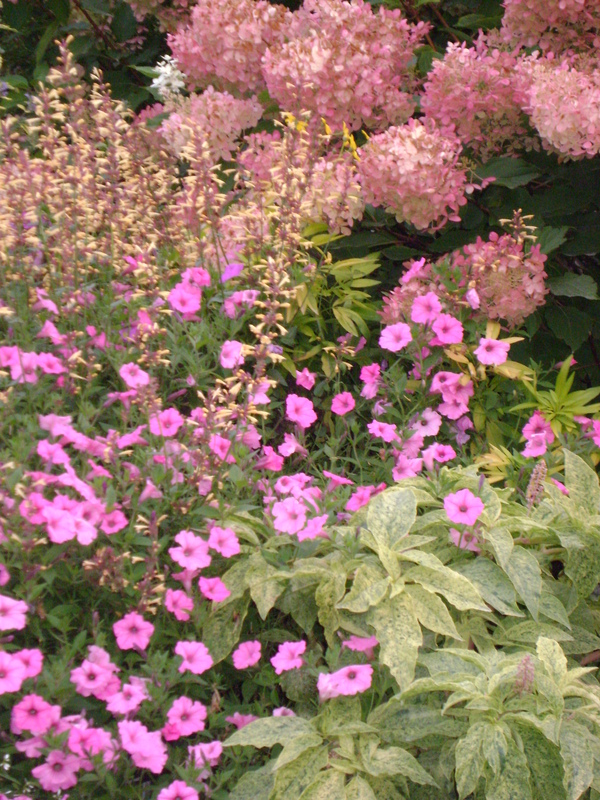 Then I will be able to take out a lot of the “free” perennials that I have been given. July 22, 2009 · Filed under shrubs	· Tagged shrubs, sumac "Tiger Eye"
I also picked this shrub up at Loblaws garden centre clearance on the weekend, “Tiger Eye” sumac. It seems like I missed the boat on this one. 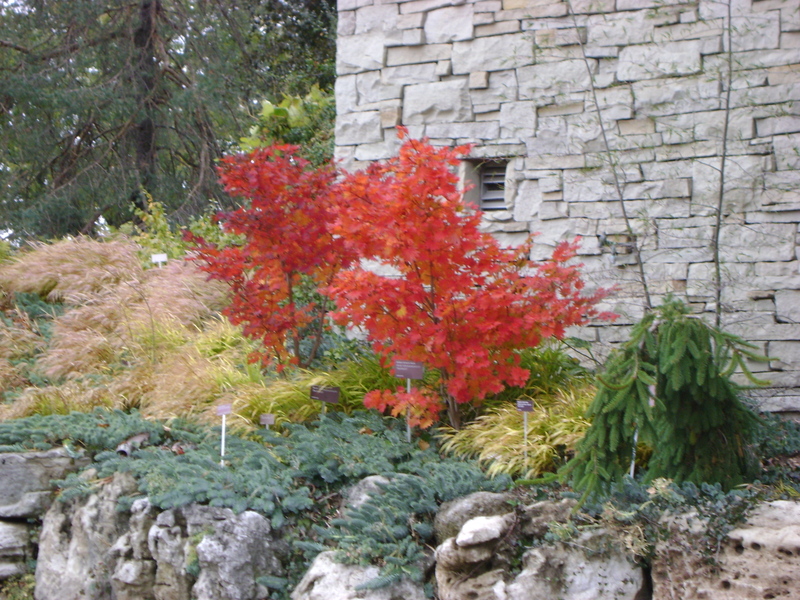 It was introduced by Bailey Nurseries in 2004 (I was living in England then) and won the Gold Medal Plant Award for 2007 by the Pennsylvania Hort Society (no excuse there). My Scottish grandmother was in love with sumacs, not seeing anything like it at home in Scotland, and had to have one in her garden here. Unfortunately, it drove my grandfather crazy as it suckered freely. This one is supposed to be non-invasive and I am planting it as a memorial to my “Nana”. I am in love with this plant, it is my favourite colour combo, chartreuse and pinky/red. 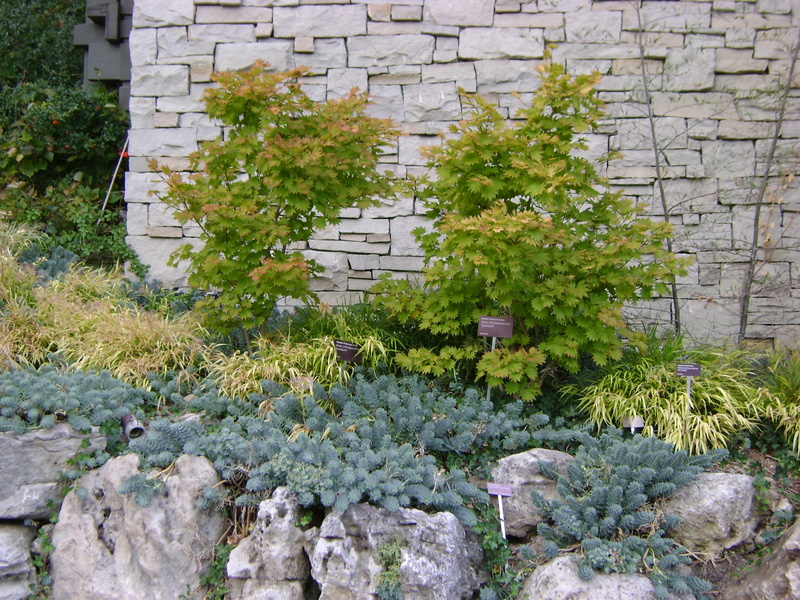 The leaves start off chartreuse, then change to a bright yellow and are supposed to be orange in the fall. 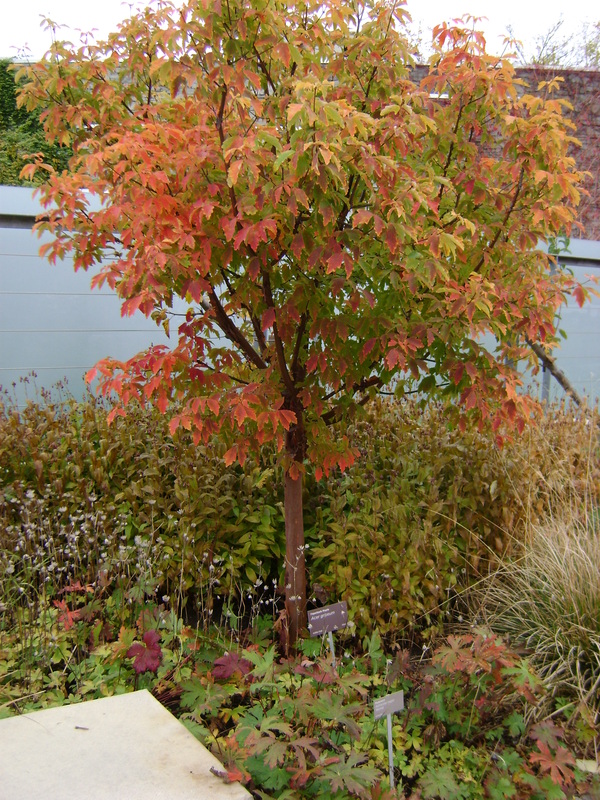 It is a dwarf (height and spread 6-8 feet), and is hardy to zone 4. 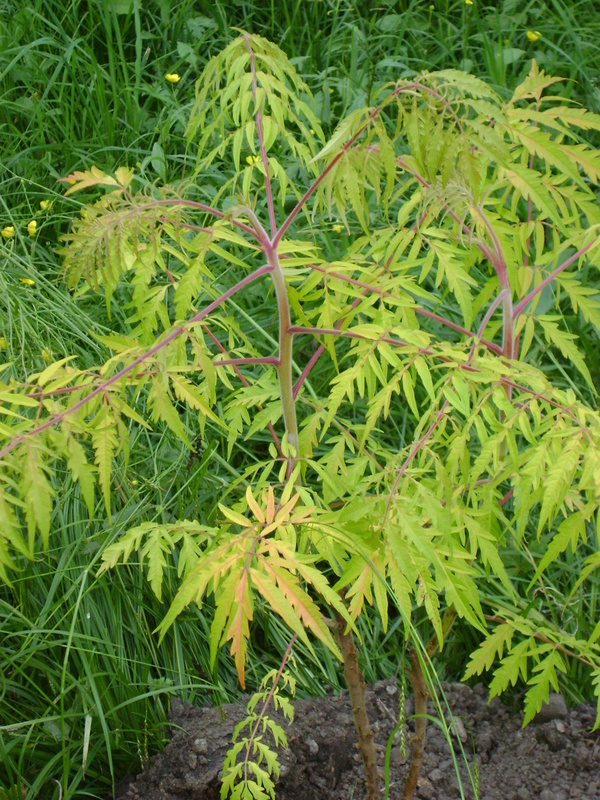 The leaves are lacy and deeply cut, similar to a Japanese Maple and it can take full to part sun. Sounds like the perfect plant, doesn’t it? I’ll let you know.